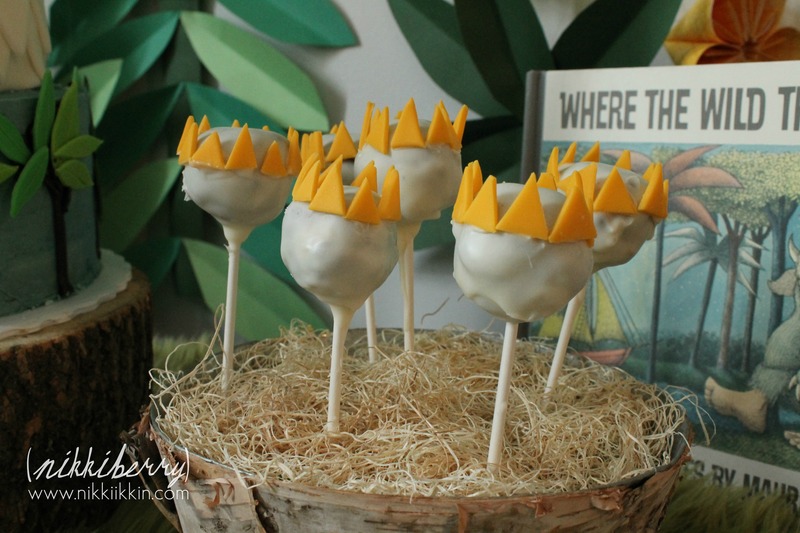 For Hudson’s 2nd party we choose a Where The Wild Things Are theme. 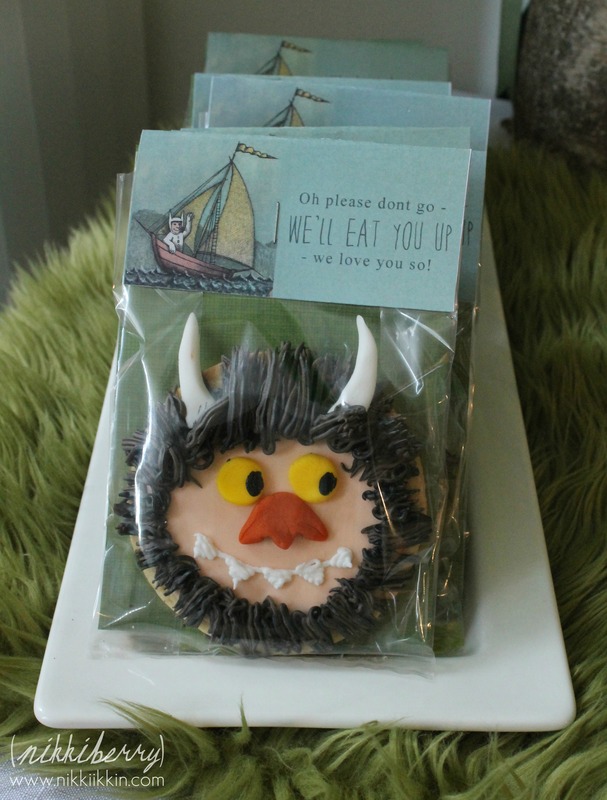 Always a classic and beloved story, we have given the book by Maurice Sendak as gifts many times. 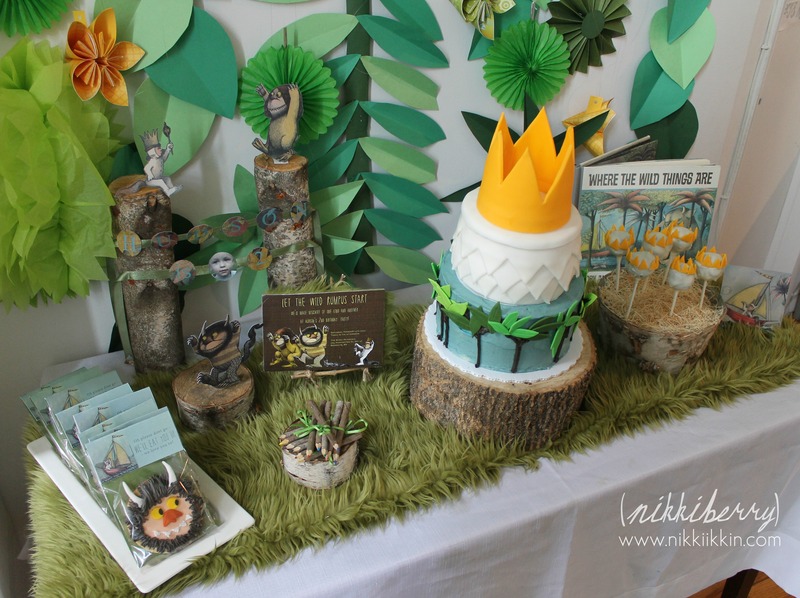 I was not only proud to do this party for my son but to share it with thousands of readers on a very popular party site called Amy Atlas Events. 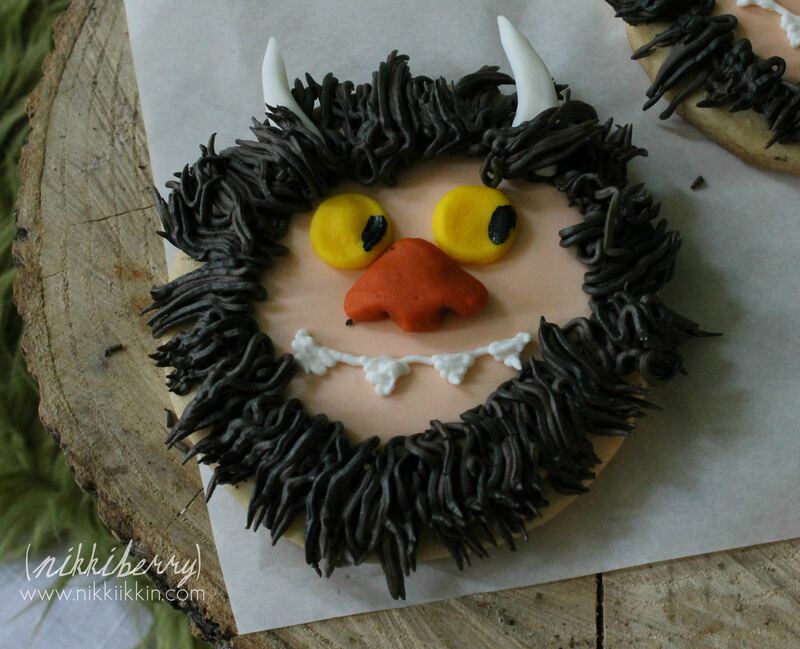 Amy Altas choose my party for a featured guest dessert submission, you can see the feature HERE! 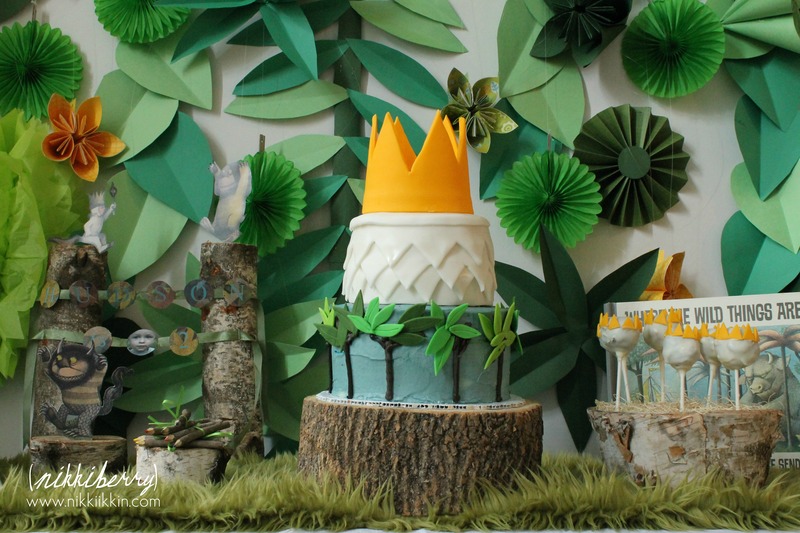 It was a big honor to be featured among the best parties on the web! If you don’t follow her blog you must check it out, and by the way her first book is coming out this week! I can only imagine the Monster Party possibilities for this treatment on cards! To make the back of the card I cut the fur patches out the size of the card before I affixed the fur to the back of the card with spray mount. Sticky fingers and fur can be a little messy, so if you try this, use utmost care in handling, have everything laid out on kraft paper (paper bags cut open-work too) and don’t rush! To make the front of the card I scanned in images from the book to use on paper goods and for the first time ever I purchased a font to use in Photoshop. This was a big deal for me, as I am self-taught in photoshop and pretty clueless to much of what Graphic Designers learn in school. I just make it up as I go along and do what I need to do to get the job done! These cards were hand delivered but an oversized envelope would allow for extra room the fur needs, I don’t think it would need extra postage, it wasn’t heavy but again, I didn’t try to mail any. The fur started an inspirational goal for this theme, I continued searching for ways to express the wild forest feeling of the story through texture. Real wood is a perfect natural texture, so I hiked it over to the New York Flower District to shop for some wood cuts. 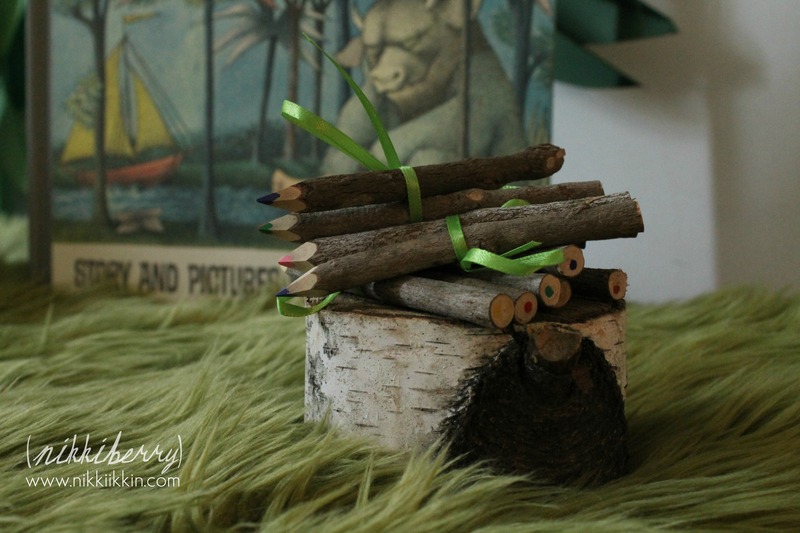 My scores were a (very heavy) tree cut to use as a cake stand, a few birch branch cuts I used to stretch a paper bunting across and shorter ones to use as small display stands. The flower district is an amazing couple of blocks just south of Madison Square gardens, it used to be a very large district but like most of Old New York times are changing, and there is only a couple of blocks left. You must go early, like before 8am early, by 11am the vendors are putting their leftovers back into the coolers and shutting down for the day. 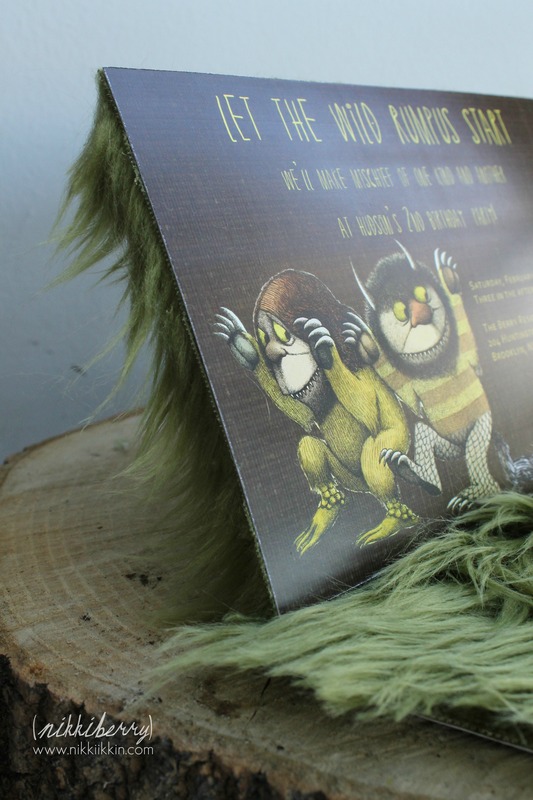 I repeated the faux fur from the invite as a runner on the desert table, which read more as grass than monster fur because it was green but it worked with the theme regardless. What about that exotic background? I don’t think it would have mattered what anything else on the table looked like, the background made it super impressive. All different greens, shapes and sizes and it was all paper, This made it inexpensive but it was all handmade, which made it time-consuming. 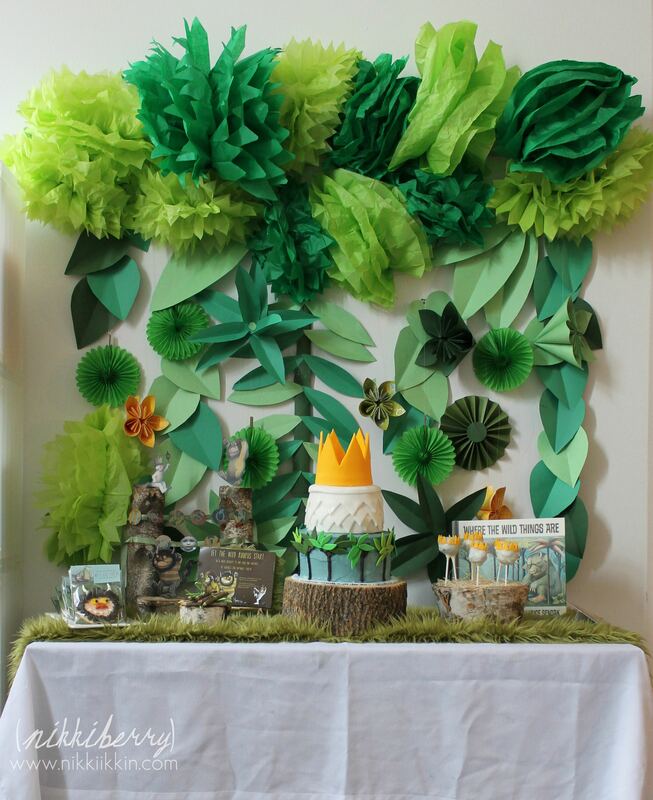 I used tissue paper for the top canopy foliage and the leaves, origami flowers, vines and fan flowers were made from construction paper. You can find cheap packs and multiple shades in teacher/parent supplies stores. Its better quality than a pack of typical construction paper but not as expensive as archival scrap-book paper, so I didn’t feel bad about tossing it. 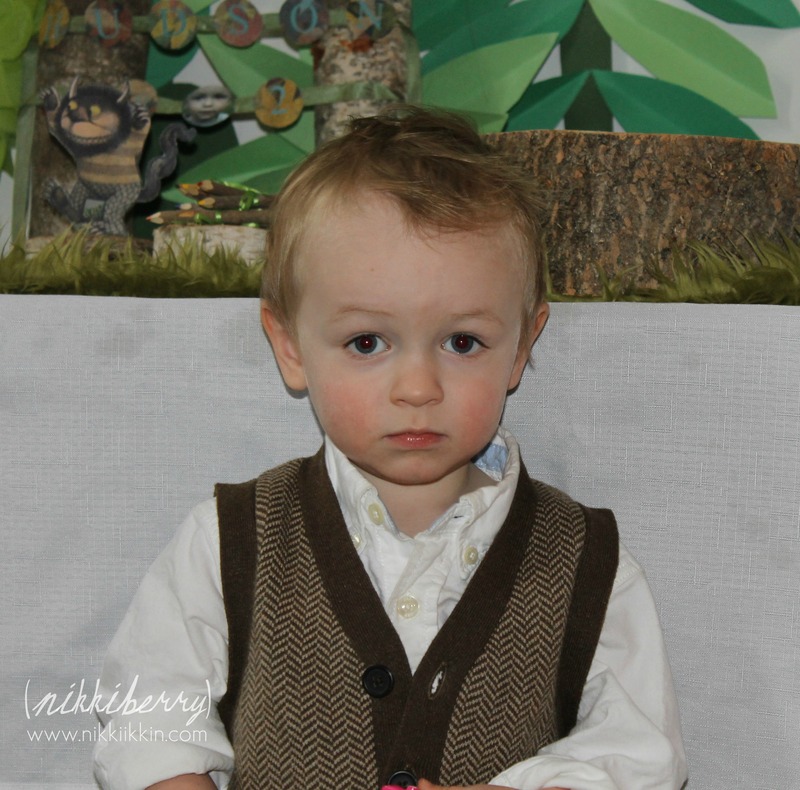 Hudson’s party was a small soiree of his playmates, I have a hard time doing parties small….I can’t help but to make a big production regardless of the guest size but I did restrain myself in the amount of sweets for this party: just cake, cake pops and a take home cookie, this was plenty for 25 guests. Another table held an assortment of snacks….. and plenty of wine….gotta have the mommy juice around when the kids out number you. 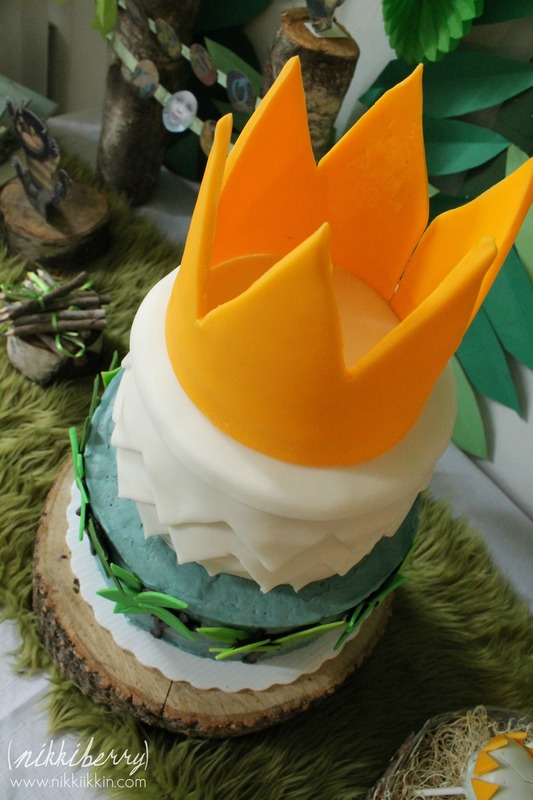 The cake was a two tier yellow butter cake, buttercream icing and fondant decorations. 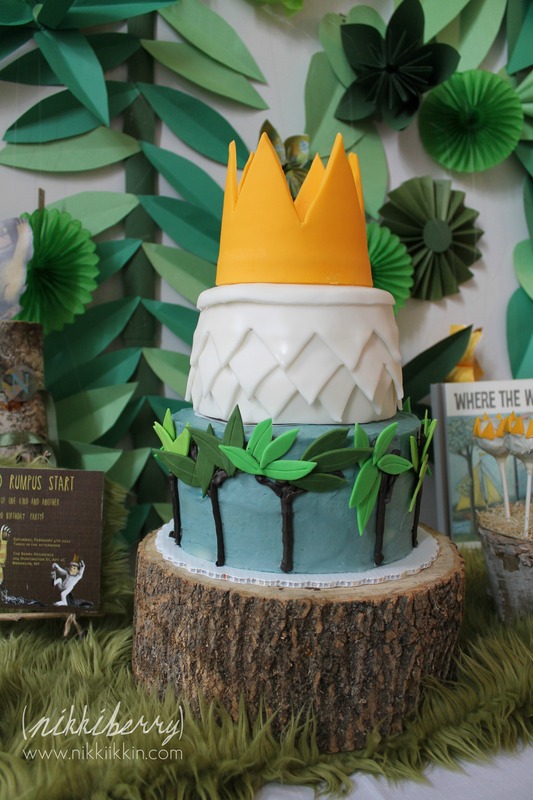 Each tier represented a part of the book, the bottom was the forest in buttercream & fondant, the top was fondant scales in the style Maurice Sendak illustrated on the main Wild Thing, Carol’s legs and the topper was Max’s crown simply made from fondant and dried till it was able to stand on its own. Inside the cake was multi layered in yellow and orange representing the shirt also from Carol. 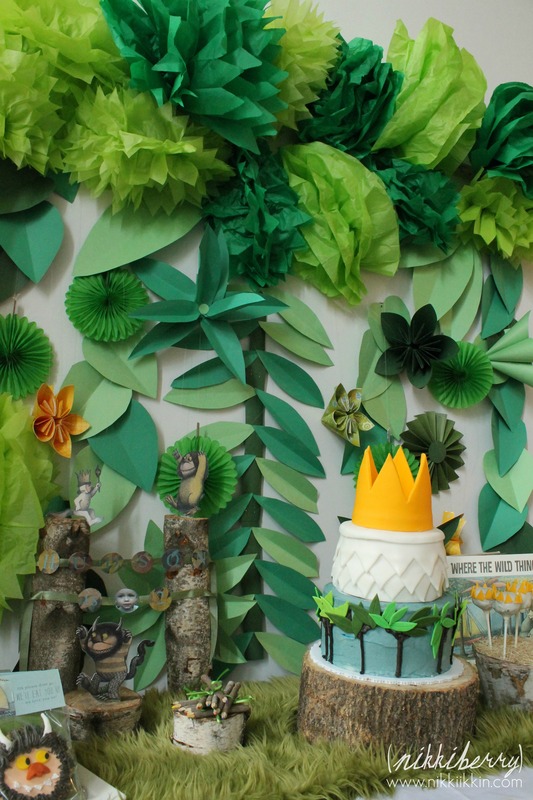 A main element for the party was an 8′ long 30″ high vinyl banner with illustrations from the book. I scanned & uploaded my pdf image and ordered the banner on sale at Vista Print. I arranged these monsters specifically for their relationship to the guests. 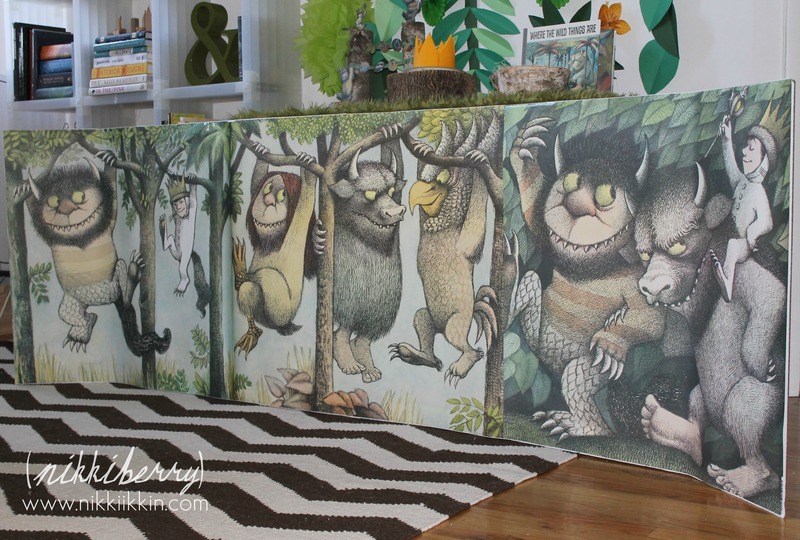 The Wild Things were literally the size of the two year olds. I double sided taped the banner to two cardboard science project boards and used it for a background where the kids played in the living room. The kids loved it and now the banner lives wrapped around the 24″ cement column in our Brooklyn loft style apartment. Hudson wouldn’t let me put it away when he saw me rolling it up after the party. 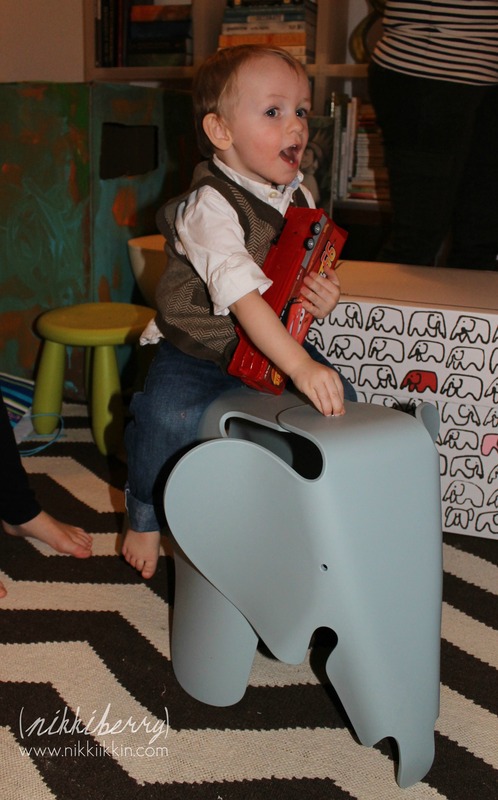 As a very special birthday gift, Hudson received for his second birthday an Eames Elephant! If you’d like to learn more about this elephant you can read my post about it HERE. 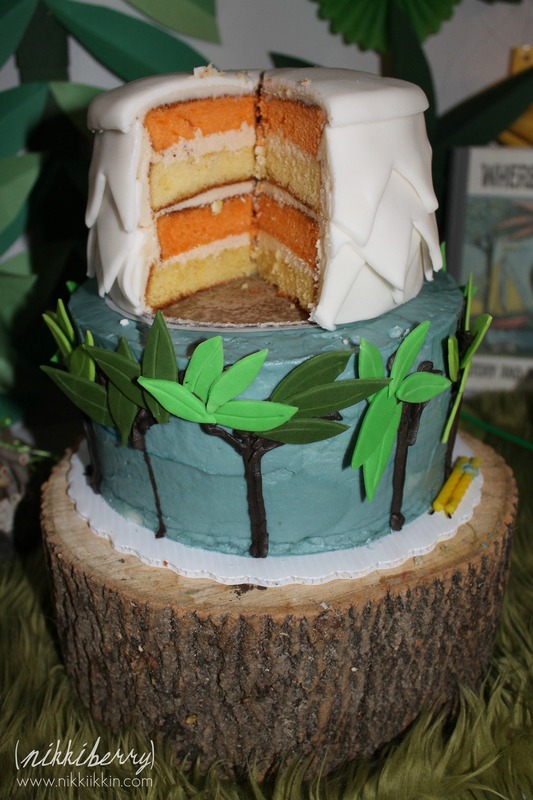 Lastly is a picture of what our guests saw first, a forest covered door that was my husband’s creation. 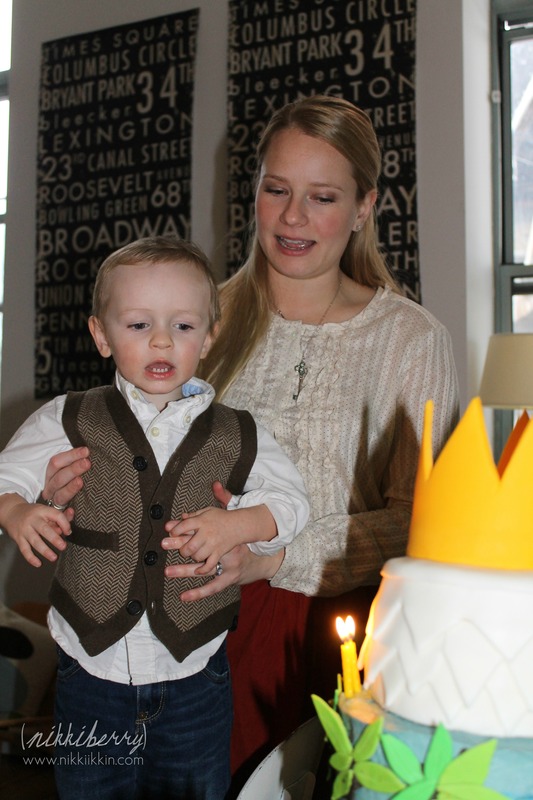 I solely let him have creative control over this decoration. 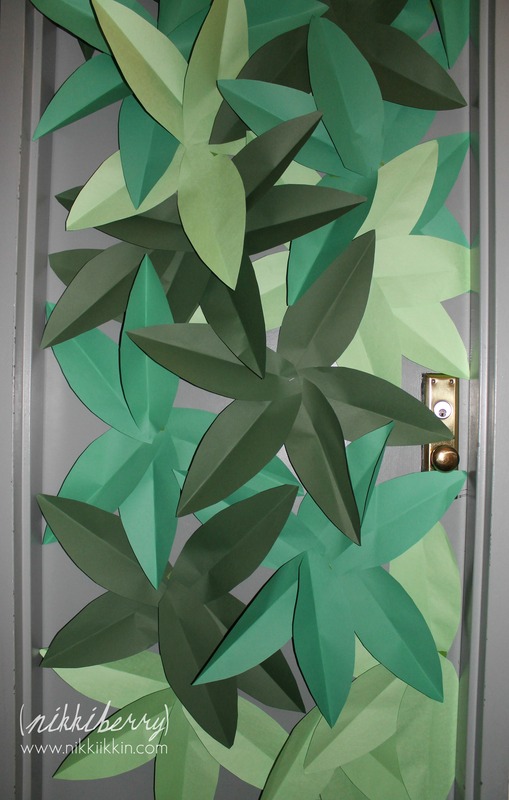 I had pictured the leaves arranged different when he explained that he wanted to put leaves on the door. I was so happy with how it turned out and glad that I let him just do it. We left it up for about a month!